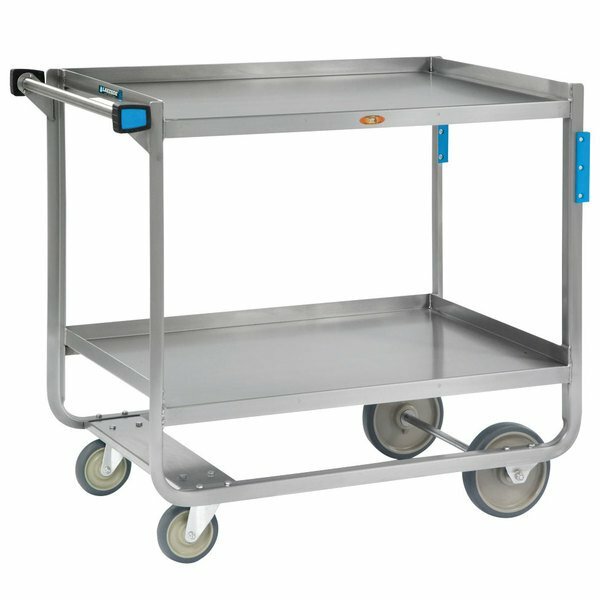 Lakeside 953 Heavy-Duty Stainless Steel Two Shelf Traditional Utility Cart - 48" x 25 3/4" x 37 3/8"
Navigating large loads over long distances is a breeze with this Lakeside 953 stainless steel two shelf traditional utility cart. Larger 8" front wheels allow the cart to transition over uneven surfaces with incredible ease, while the U-shaped frame provides superior structural strength for larger loads. This item boasts two 24" x 42" shelves with a clearance of 21". Additionally, each shelf edge is reinforced to accommodate extra capacities. Stainless steel construction adds extended durability, in addition to making the item easy to clean and sanitize when not in use. All four wheels boast no-mark, extra load cushion tread to absorb impact, reducing vibration and strain. Other features include all bead welded joints and integrated bumpers on both the legs and handles to protect walls and furniture. The Lakeside 953 utility cart is recommended for heavy-duty use and features a 1000 lb. weight capacity.